Few subjects draw the ire of neighborhood residents like bike lanes. 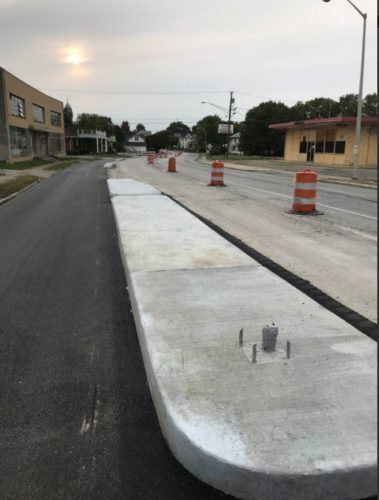 Our posts on the Broad Ripple bike lanes featured comment threads that got almost out of control. And to this day, I still think in general these lanes are a positive change, as vehicles drive slower through the section now, and the road feels safer to the user (including pedestrians and drivers, as well as cyclists). The lanes are basically a simple coat of white paint. The pavement that was a 40-mile an hour 4 lane road is slightly less of a stroad now. I’ve recently wondered if part of the controversy behind painted bike lanes is that drivers can easily see where they used to be able to drive. That’s not a problem when the lanes are separated by concrete and grass medians. If the street undergoes some fundamental transformations, it’s less obvious that this used to be a speed track. This street is different from the bike laned portion of Broad Ripple in another significant way: It featured parallel parking along both sides. If there is controversy, it will be with taking away some of that parking. But I don’t see that lack of parallel parking as a deal breaker here. The side streets should have plenty of parallel parking. 1) if you don’t live on the near eastside, you probably didn’t realize there were bike lanes on MI/NY to begin with. Complainers from outside the area are unlikely to think much about MI/NY streets in the same way they are downtown or Broad Ripple streets. If you want to stir up controversy, ask Irvington residents what they think of converting MI/NY into two way streets on the near eastside. That’s where the controversy is. One thing for certain: between about State and Emerson, the people who live right on NY and Michigan lose a significant portion their street parking in a change to two-way operation. Neither street consistently has rear alleys, and so this would be a real (not imagined) problem that would make the housing fronting the street less valuable. The addition of these protected lanes should (but perhaps won’t) put to rest the notion of a two-way conversion. I think that the concrete bus islands will be great, and bikes won’t have to play cat and mouse with the bus anymore. But a two way conversion now would mean that it’s impossible for cars to pass the bus, without making a dangerous (and probably illegal) pass in the oncoming lane. I’m all for traffic calming, but not necessarily to 15 mph on an arterial. There are not very many houses that face New York and Michigan between State and Rural. Most of the houses face the side streets. There are more between Rural and Emerson that face NY & MI. Most of the areas that do face NY & MI do have alleys (but I don’t know what condition they are in). If the city is wise, any conversion to 2-way would also include alley upgrades. Pretty much everything (residential) between Sherman and Highland on Michigan is oriented toward Michigan. And you’re right, most of those blocks are served by parallel alleys. New York is more of a mishmash, but there are definitely a couple scattered blocks of houses that front the street without alleys. These are amazing. I hope the city finds some cash to do more! Fantastic! Make more of them! I live in Irvington and bike commute to/from downtown. I’m pretty psyched about these lanes as long as they don’t make things harder for the folks who live along the way. I like how the protected lanes on Penn downtown didn’t eliminate street parking. There are a lot of near east side residents who bike or take the bus out of economic necessity, though, so this has the potential to be good news for them. We should work hard for a completed protected bike lane from Irvington to the Penn Street Bike Lane. Studies show that cities need to complete an entire system to really start bringing people who are nervous about bike commuting out. I would love to see an IRV to DT connection, but would love to see the City create it by using the existing Pleasant Run Trail from Washington & Emerson down to English & Belt Line, then take a lane of English away all the way to Fletcher Place at Shelby. just short of the interstate, then jog north and use the disused rail bridge south of Bates, or even Bates itself…which then gives a straight shot into The Cultural Trail at Virginia & Anthem HQ. Takes the Michigan/New York argument out of the picture. 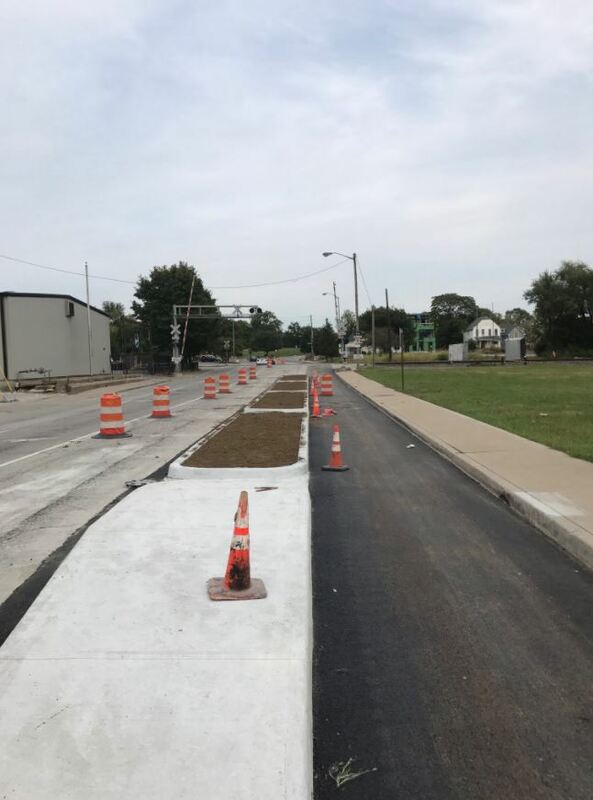 Helps put more bike infrastructure and Downtown connection into Twin Aire, one of the next “Great Places” neighborhoods and future home of the county Justice Center. While I agree that there need to be substantial improvements to the Pleasant Run Greenway, I don’t agree with using it as a reason to leave a gap in the protected bikeway network through one of our cities densest and most disadvantaged neighborhoods. I would also advocate for sending the protected bike lanes to Irvington down the rest of New York and Michigan. These are heavily traveled corridors and shouldn’t be left behind simply because it might be challenging. Given the level of reinvestment and the amenities added over the past 10 years, I’ve reached the opposite conclusion: it is time to add investment south and north from the NESCO area. Twin Aire (and the neighborhood east of Fletcher Place over to Rural) and Martindale Brightwood are more disadvantaged today, and building off the Pogue’s Run and Pleasant Run trails is a good beginning. I think it should be both. Now that the double bike lanes exist between Rural/downtown on New York and State/downtown on Michigan, it doesn’t make a ton of sense unless they ultimately connect to the PRT and Pennsy network in Irvington. At the same time, English certainly does not need to be a four lane street and easily could afford to give up a lane for a protected two-way bike lane, particularly in light of its proximity to the new justice center. English is a mile south of Michigan Street and .85 south of New York Street, so this would not be redundant infrastructure. (and if they decide it is too close, they could use Prospect instead. 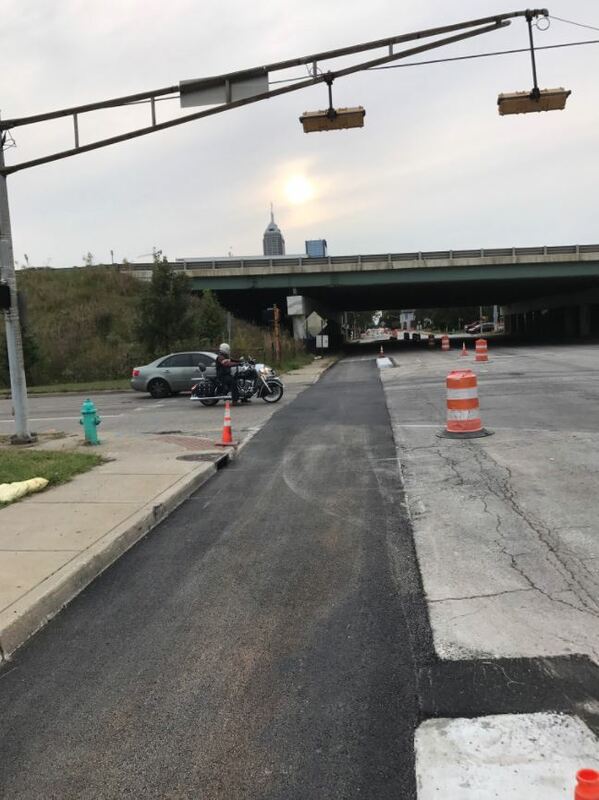 Prospect already has painted bike lanes in both directions, so they could create a protected lane without taking away any current parking or traffic capacity). As noted, and particularly in light of the justice center, the PRT needs some attention. There needs to be a real crossing of Washington and Emerson and some sort of solution at the rail underpass just north of Brookville Road. 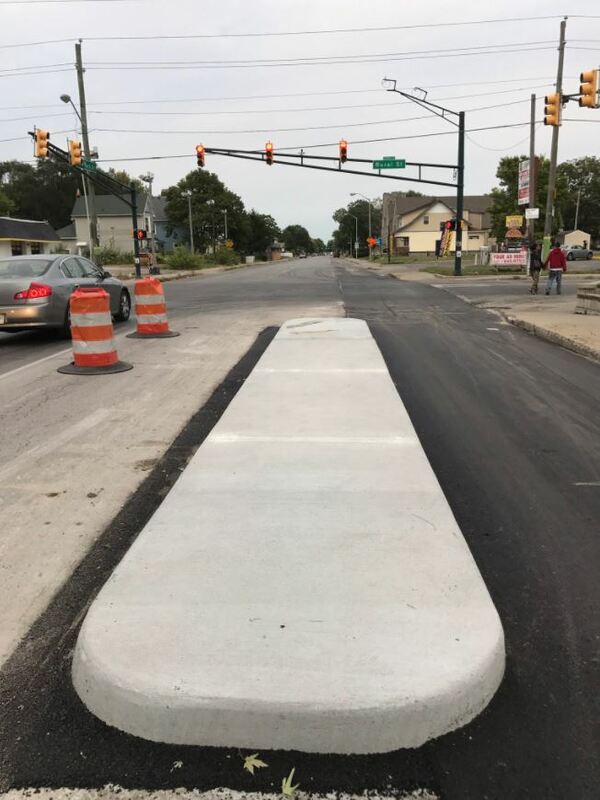 The crossing of Shelby Street should be upgraded. But the most gaping problem in the PRT is at English. Even if they ultimately chose Prospect over English as a route into downtown, something has to be done for the PRT on that awful stretch. As for parking along New York and Michigan, I have commuted both streets for over a decade, and the street parking is pretty lightly used except between Linwood and Emerson. Both streets do have alley access between Wallace and Emerson, but it’s true that some residents will be upset about having to park across the street or around the corner from their houses. I don’t mean to be insensitive, but that’s life in the big city. Residents don’t own the street in front of their houses. Well I would say that every street does not need one because most secondary streets are perfectly comfortable for people of all ages to ride on. Shared space & calm streets should be a goal for all of those streets. Arterials are where they are needed because of 1. The need to separate higher traffic volumes from cyclists 2. These roads are often direct routes to different parts of the city 3. These roads often have plentiful destinations themselves. Every arterial, for sure. Every street? Nah. I ride Alabama from Fall Creek to downtown and there really isn’t much of a need for dedicated lanes on a street like that. Every street might be overkill, but it sounds like both of you are adults who are experienced and comfortable riding bikes. How do you push the cycling rate up when you don’t design for the elderly or young kids? You don’t design for the elderly or young kids. You teach. Adults teach young kids how to ride on streets. Then the kids become the adults, and the adults become the elderly. Since people have muscle and brain memory, the lessons are not generally lost…hence the phrase “it’s like riding a bike”. We are getting ready to update our bicycle master plan. I would be great if UI collected ideas on routes, connections and the such to contribute…. That would be fantastic, Jamison! I would bring StrongIndy into the group as well. Maybe we can have UrbanIndy and StrongIndy sit down and hammer out some ideas in a group session? Like prospect st? 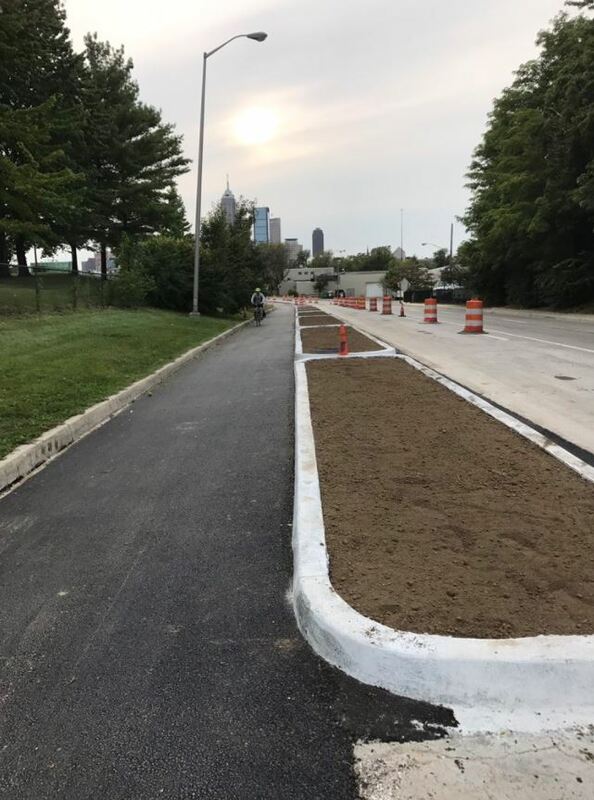 from the new jail/drug treatment center all the way to the cultural trail would be nice. i currently ride on woodlawn because you’ll die on prospect. These look like great protected bike lanes. The more I cycle, the more I realize cycletracks should be the standard and not the “deluxe” choice for bicycle infrastructure. I’ve noticed as construction has continued along New York, people are PARKING in the bike lane. I hope the city has some plan to enforce towing of cars who choose to do this.